Holy Chitra Navratri & Sri Ramanavami Utsav (March 21, 2015 - March 28, 2015) : Holy Chaitra Vasant Navratri was celebrated in the ashram’s temple with great enthusiasm. Sri Ramcharit Navanha Parayan was recited everyday from 4 pm. to 7 pm. led by Sri Kamlesh Shastri, priest of the temple. Devotees from Ahmedabad as well as Baroda, Canada and other places joined the holy recitation. Culmination was on Holy Sri Ram Navami was celebration on March 28, 2015 with special archana, arati and prasad in Sri Ram – Hanuman temple. Birthday celebration (March 24, 2015) : A special satsang was held on the happy occasion of 97th Birthday of H.H. Sri Swami Gurusevanandaji Maharaj, a senior monk of the ashram and 94th Happy Birthday of Revered Sri Dr. Patani Saheb, a senior trustee of the ashram. It was celebrated in evening with prayer, satsang and Sri Guru Paduka poojan followed by grand feast. All near and dear ones greeted them with love. As always, daily five Yogasana practice Classes and Two Yogasana - Meditation classes for beginners conducted and about six hundred new people participated these Yoga classes this month. Shankha Prakshalan Yogic Kriya : On March 1, 8 and 22 was arranged by Yoga teacher Ms. Sangeeta Thawani and her team. About 160 participants joined this Shankha Prakshalan Kriya. 72 candidates came from Yoga Niketan of M. S. University, Baroda. Reiky level 1 and level 2 are being conducted every month regularly by Reiky Grand Master Mrs. Rupa Majmudar and her team. Dr. Snehal Amin is regular in his Yoga consultation twice a week on Wednesday and Friday evenings. Food for children through Narayana Seva, monthly 600 kg grain distribution to the needy families through Vishwanath Seva Kendra, Daily Satsang & Puja Archana in the temples was performed at Ashram. Sunday satsang, Purnima’s Sri Satyanarayan Vrat Katha and Sri Lalita Sahasranam Parayana are regular part of the Ashram’s activities. Pansalwa, Bihar (March 1, 2015 - March 2, 2015) : Mammoth crowd of devotees of Sri Mai Hee " Swami" was addressed six times in different six sessions in three days by Revered Sri Swami Adhyatmanandaji Maharaj. About four lakhs devotees gathered from all over India. 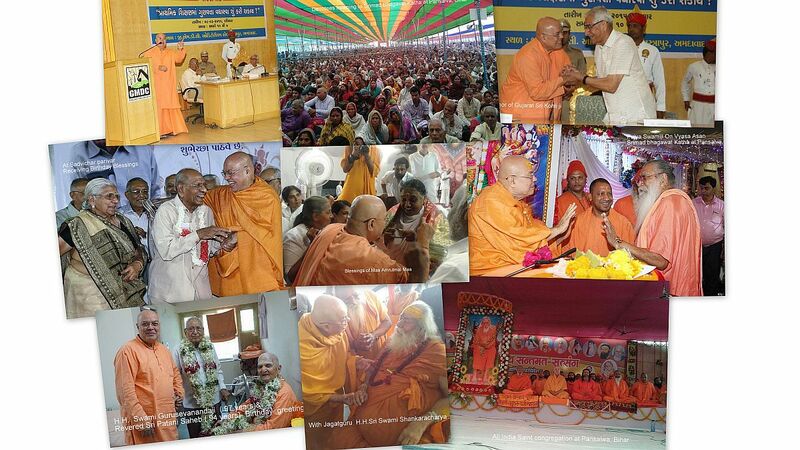 This function was "All India Sant Meet’s 104th congregation of Mai Hee Swami's devotees. About 250 monks graced the stage and blessed the devotees. In last fifteen years, Revered Sri Swami Adhyatmanandaji Maharaj presided over the congregation for fourth time. Patna (March 3, 2015): Pansalwa is an interior village in Bihar situated at the bank of Koshy river. There Sri Swami Adhyatmanandaji Maharaj arrived here this morning. Swamiji stayed at the Guest House of the Governor House. Sri Swamiji visited Sanjay Gandhi Botanical Garden and conducted Satsang at Kankad Bagh. By afternoon flight, HE arrived Delhi on March 3 rd. Devotees at Delhi Airport had Revered Swamiji’s darshan, satsang and Prasad. Ahmedabad ( March 8, 2015) Achala Education Foundation Trust organized day long program sharing serious thoughts upon improvement of primary education. Learned scholars were gathered and shares their views on the educational system and the roll of students, parents, teachers, school management and interference from politician or otherwise. Omprakash Kohliji, Mr. Pravin Laheri and Sri Swami Adhyatmanandaji was the guest of honor. About thirty educationists were honored by Revered Swamiji and H.E. Governor of Gujarat Mr. Kohliji. Codes were established 1) Teachers must avail thorough knowledge of the subject that they are supposed to teach. 2) They must be aware of the subjects related to the main subject with what they are dealing. 3) Teachers must have interest in teaching. 4) Teachers must create an interest amongst the students so that they learn with enthusiasm. 5) Teachers must come down to the level of students to share their knowledge. 6) For each period, teachers must prepare frankly to share the knowledge. 7) Teachers must respect each querry of students and should give correct or prompt reply and never “ bluff “ them. 8) In no situation, teachers should share their personal or family problems with the students. 9) Teachers must respect all students at all time in all conditions. The last session was presided and honored by H.E. Governor of Gujarat. Sri Swamiji gave inspiring speech. Ahmedabad (March 10, 2015) J. G. School of Performing Arts’ students performed ‘ UDAN ‘ drama about two hours in length. It was based on a real story of Ms. Arunima Sinha ( Padmasri ), a brave lady who fought for her survival in all odd situations and finally climbed Mt. Everest. Sri Swami Adhyatmanandaji and Sri Swami Nikhileshwaranandaji of Sri Ramkrishna Mission, Baroda were guests of the honour. On March 15, 2015 Revered Sri Swami Adhyatmanandaji Maharaj and Dr. Jyotiben Thanki, well known artist and a public speaker were invited at Sadvichar Parivar function to celebrate their one of the trustees 85th birth anniversary. Borivali (March 17, 2015 - March 23, 2015) Honoring humble invitation of worshipful Mahant 1008 Sri Gulabnathji Maharaj of famous Gorakshadham of Borivali (East), Mumbai. H.H. Sri Swami Adhyatmanandaji Maharaj conducted Srimad Bhagavat Katha. During the katha period, most famous and young M.P. Yogi Adityanathji Maharaj, Revered Swami Ananda of Sri Mahalakhsmi Temple, Mumbai, H.H. Shankaracharya of Shardapeeth, Dwarka Revered Sri Swami Swaroopanandaji Maharaj graced the occasion.